Upon arriving home today from work, there was a package from the fine folks at OCZ. Inside was one of their Socket A coolers! This one seemed a lot heavier than the others. After opening the box, I realized the cooler was one of their all copper heatsinks. As many of you already know, the material known as copper is a great medium for transferring heat. Many heatsink manufacturers are now producing all copper units, or aluminum units with copper inserts at the bottom. The Gladiator uses a thin fin design which maximizes air flow. It comes in measured at 60mm X 65mm, big enough to cool and small enough to fit on most motherboards. Although the heatsink is all copper, this unit did not feel that heavy. The heatsink itself is not as large as some of the units we have come accustom to. But don't let the size fool ya! 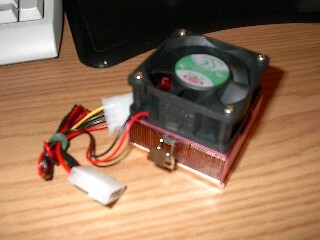 As usual, OCZ has partnered this heatsink with a Dyaneon 36CFM Fan.